KORRES® Pomegranate Mattifying Treatment, abreathable, oil absorbing formula that instantly fills in pores leaving the skin with a smooth, even, matte finish while minimizing the appearance of pores throughout the day. KORRES® Pomegranate Purifying Natural Clay Mask, deeply cleanses and tones the skin, tightening pores and absorbing oil. KORRES® Pomegranate Toner purifies the skin’s surface, minimizes the look of pores and helps to reduce the appearance of redness, while leaving the skin feeling soft and fresh. KORRES® Wild Rose + Vitamin C Advanced Brightening Sleeping Facial, weightless soufflé texture made with Vitamin C and Wild Rose Oil, works while you sleep to renew dull, tired skin by morning. 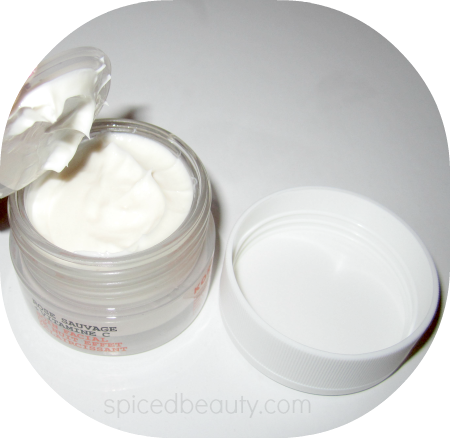 It melts instantly into the skin to re-texturize skin for smooth skin by morning. 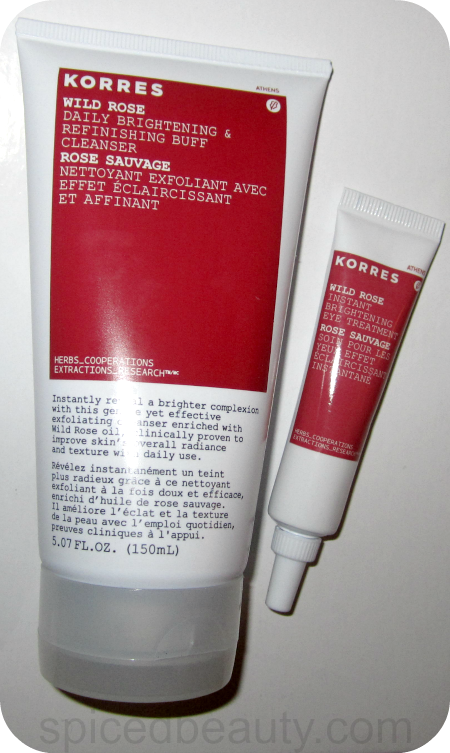 KORRES® Wild Rose Daily Brightening & Refinishing Buff Cleanser, a gentle yet effective exfoliating cleanser enriched with Wild Rose oil, clinically proven to improve skin’s overall radiance and texture with daily use. KORRES® Wild Rose Instant Eye Brightening Treatment, a cream formulated with Wild Rose oil in combination with yeast, ruscus and horsechestnut extracts. This formulation helps to add radiance and rejuvenation to the delicate eye area, while minimizing the appearance of dark circles and fine lines. 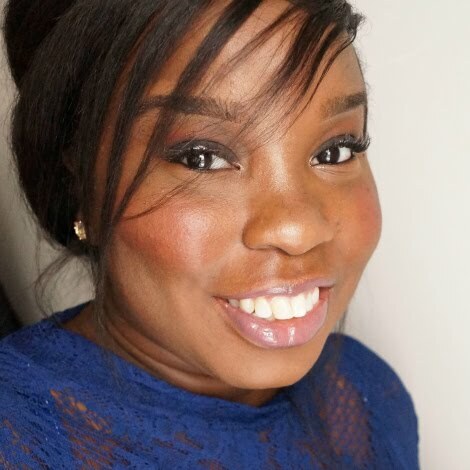 I've been using these three products daily for a few weeks and my skin is amazing! 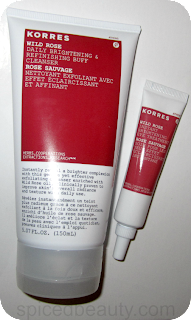 Start off with the KORRES® Wild Rose Daily Brightening & Refinishing Buff Cleanser. It's reminds me of a facial cream with light exfoliating beads. I get no irritation on my skin from using it daily. Then twice a week I tone using KORRES® Pomegranate Toner. It's light so you can use it daily. 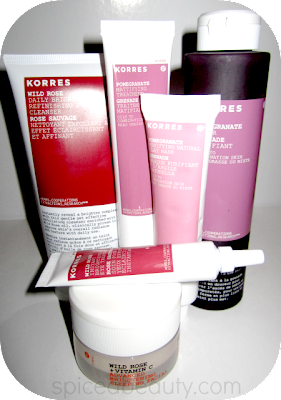 Lastly, here is my favourite step: KORRES® Pomegranate Mattifying Treatment. I'm definitely a "matte" girl. I'm not one for the "dewy" face look on me. This product keeps my t-zone under control. I wish I had this product this summer. It would have truly saved me! Is there anything from the line that you would like to try? seems like a great range would love to try everything u jus mentioned hun! I would love to try the KORRES Pomegranate Mattifying Treatment along with the cleanser and toner...will be ordering soon, thanks for the review. I would love to try all three products, especially the mattifying treatment. 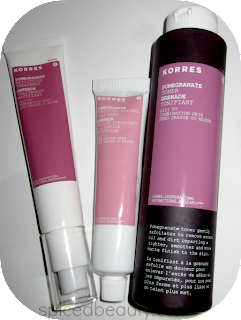 Korres is a very promising line of products. It stands true to its claims product after product. 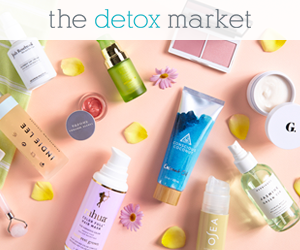 Being organic, it is totally natural and gentle on the skin.